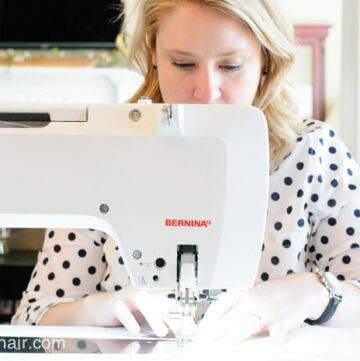 I wanted to take a minute and talk a little bit about some things to keep in mind if you get a new Sewing Machine. 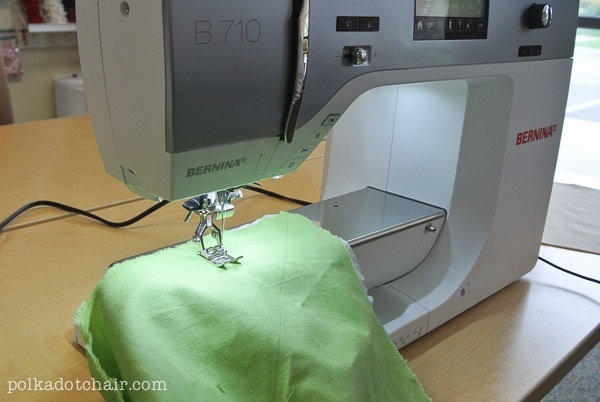 Until I started sewing with my Bernina 710 this Spring I had been sewing on the same sewing machine for 12 years. So I know that this is not a regular occurrence for most of us. For those of you shopping for a sewing machine or who just purchased a new one (who hoo congrats!!) I thought I’d share a few tips that I’ve learned along the way. 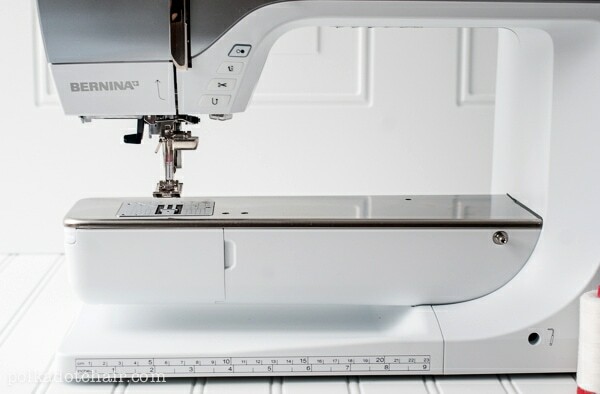 Last year I wrote a “How to Pick a Sewing Machine” blog post. As this is the most frequent question that I get on my blog. I hope that it addressed some of the questions that you may have as you are shopping for a new machine. Now I’d like to talk a little bit about some things you can do after you get your new machine to avoid some potential frustration. I mentioned in my previous post about picking a machine that I recommend buying a machine from a dealer. Purchasing from a dealer give you a REAL person that you can come to when you have problems, or if you get stuck. Can’t remember how to thread your machine? You can take it into the dealer and they can show you. Having problems with your bobbin? Most can service your machine for you. With that in mind here are 4 things to do after you get a new machine. 1- Take the new owner class- I purchased my first sewing machine at the Smocking Shop in Louisville Kentucky. 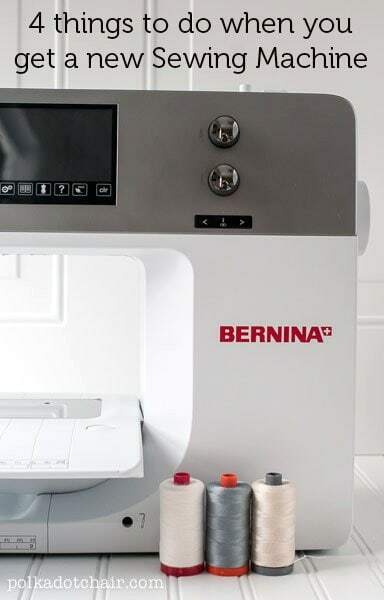 I also picked up my Bernina 710 and took new owner classes for it from the same shop. One of the things that I like most about purchasing a machine from a dealer is that they almost always come with free new owner classes. Each shop is different so be sure to ask before you buy, but at the Smocking Shop they provide free new owner classes for EVERY machine they sell. Even the ones that cost $199. Plus you can go back and take the class as many time as you need until you feel comfortable. I hear many people say that they are having a hard time learning to sew. I think that some of this may stem from they don’t know how to use their machine. Taking a class is one of the best things you can do to improve your sewing skills. 2- Read the owners manual, or at least keep it close by. I know I say this a lot. But you guys it’s sooo important. How many times in school did our teachers tell us to “read the instructions”?? The same goes with a sewing machine. Read the manual!!! Do you know what all of those feet are that came with your machine are for? Okay if you won’t read it at least keep it close by. 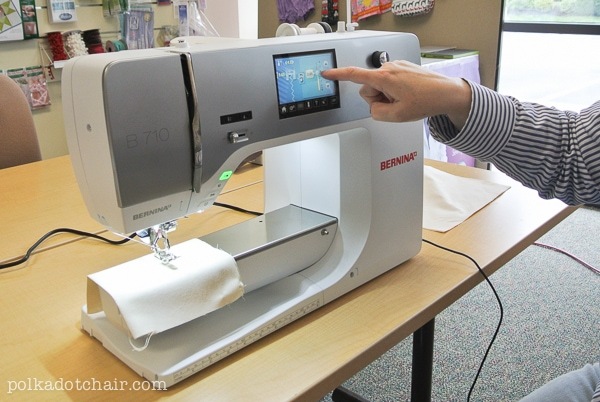 Or if you have a Bernina you can watch the instructional DVD that comes with the machine and check out their youtube channel. 3- Check to see what kind of maintenance your machine will need. Each sewing machine manufacturer is different. Some machines need to be oiled regularly. Check to see if the machine will need to be oiled, and if so, how often. It’s really easy to do. All machines will need to have the bobbin casing cleaned out regularly. Just pop it off and use the brush that came with your machine to clean out the lint. 4- Take it in for a service once a year. You take your car to get the oil changed every 3-6 months right? Well your sewing machine is not any different. A full tune up will keep your machine working for years to come. You invested a lot of money in that machine, make sure that you take care of it. 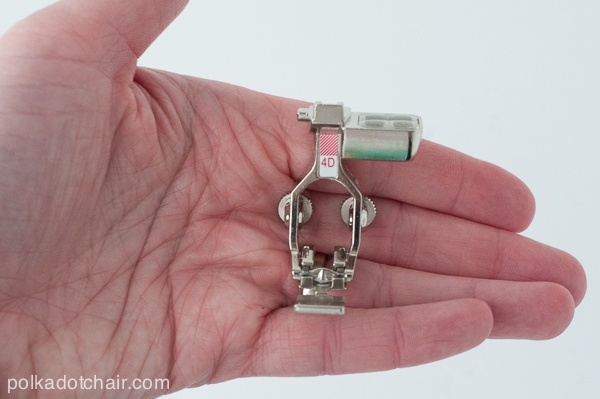 Regular maintenance can help keep your machine sewing at full quality for years! I hope that some of these tips and the tips I’ve shared in previous posts help you. 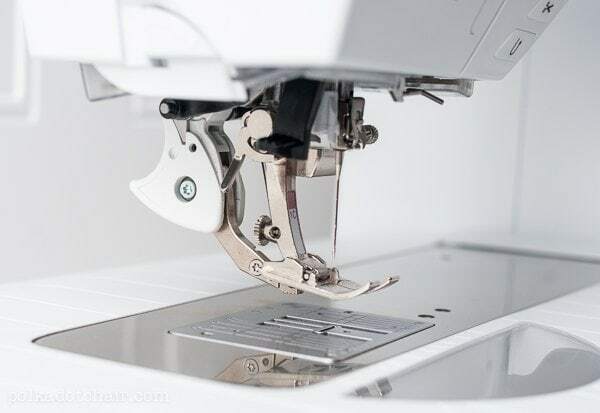 This post was sponsored by Bernina but I want you to know that these tips apply NO MATTER what sewing machine you have and regardless of the cost of the machine. Knowing how to properly use your machine will save you SO much time and frustration! This is a GREAT post…thanks! I was looking for photos for the post and just had to throw that one in, no one ever seems to mind pretty pictures of fabric! I got a new sewing machine last year and I have to admit things have certainly changed since my last machine purchase in 1980. 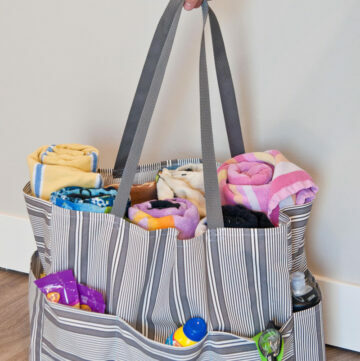 While I did not purchase my machine from The Smocking Shop I have been there many times and they have a wonderful knowledgeable staff that always go out of their way to answer my questions. I settled on a Brother sewing machine and while it was a little scary at first I think after this past year I have kinda got the hang of it. I had never thought of taking my machine in for a service but after reading this I realized that mine is certainly due for one. Thank goodness The Smocking Shop is an authorized Brother dealer and I am sure they can take care of my machine. Thanks for the insight as always! They’ve got a great service department for sure! 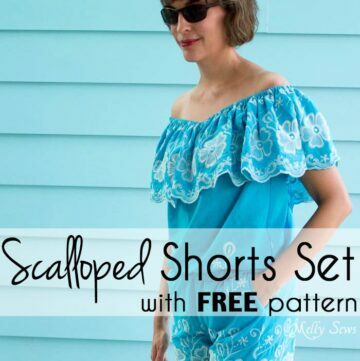 Love the Smocking Shop! I too just recently bought a new Bernina sewing machine from the Smocking Shop and am trying to enroll in the mastery classes! Looking forward to using it! Those mastery classes look so great! They are on my “to do” list for later this year. Great tips! Husqvarna Viking person myself but sewing machines have come a long way since our mother’s machines. The classes can teach an old dog new tricks so to speak. The extra TLC keeps the modern technology running smoothly resulting in fantastic stitching. Hello, I am an absolute beginner and looking into buying a sewing machine. The things I would like to be able to sew are quilts, blankets, scarves, hemming jeans/pants. And that is about it for now. PErhaps as my children grow i will be more inspired to do more on the machine but I know that quilting takes some skill so that is something I would like to be able to do well. In my search for the perfect sewing machine I find its a bit overwhelming with the selections would you have any advice on which machine would be something ideal for what I would like to do listed above? Any advice is greatly appreciated. I bought a machine like that myself once. It was the floor model from the previous year and I got a great deal on it. It’s a great tip! Thanks for sharing it! See about home or renters insurance coverage also. Usually it can be what they call “scheduled” and with the cost if many machines now a days , you wouldn’t want to lose it, or be paying on it when the machine has been destroyed in a calamity or stolen. If your agent pooh poohs the idea, tell them what you spent on it! Yes, That’s a great tip. Thank you for sharing it! Your blog is right on. I would add one thing. 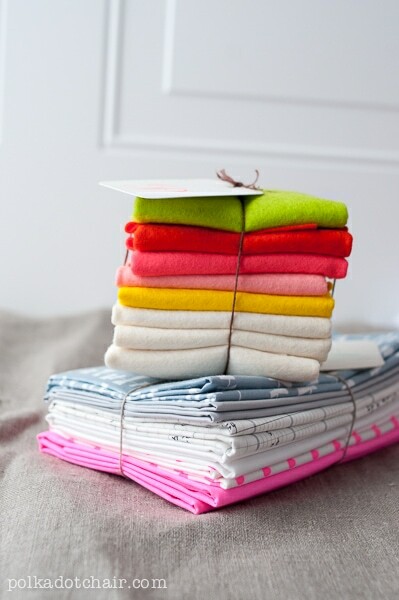 Do a sampler….try every stitch on your new sewing machine. Experiment with changing the stitch width and length. I stupidly did my sample on a piece of scrap fabric left over from cutting a sleeve out and I found that I was still using that piece of fabric some 20 years later! Be sure to use the correct foot and stabilizer when it’s called for. When I teach new owner classes I always make this a homework assignment from the first class. I never have to ask who did it. I can tell by who is comfortable with their sewing machine at the second class. If you have one of those mega stitch machines, then just do one menu at a time. Do another menu the next time you sew something. The other thing I might add for sewers with some experience, is to buy the most machine you can afford. You will grow into it very quickly and you won’t outgrow it for quite a while. I bought a top of the line sewing machine in the 1970s and I didn’t outgrow it until hoop embroidery came along. I’d look at newer machines, even computerized ones, and my old one did pretty much everything the new ones did. I didn’t feel the need to get a newer one. what about if we take care it for ourselves. is this a must thing to get service each year? Lots of good content. 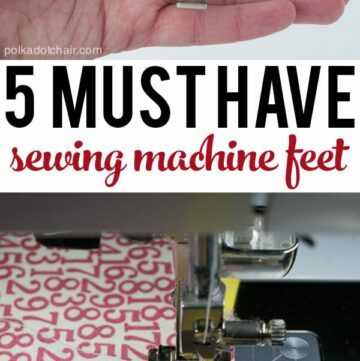 I’m trying to find the post of the 5 sewing feet but keep coming to this one. (Maybe my link is flawed from Pinterest.) Any help? Also, in the last pic if the 770QE, you may realize by now, but you have the dual feed engaged with a foot that is not dual feed compatible. I love my 770QE too! Thanks for your blog!